Since he launched his bid for the presidency last May, Sen. Bernie Sanders has been dogged by persistent questions about his identification as a democratic socialist. 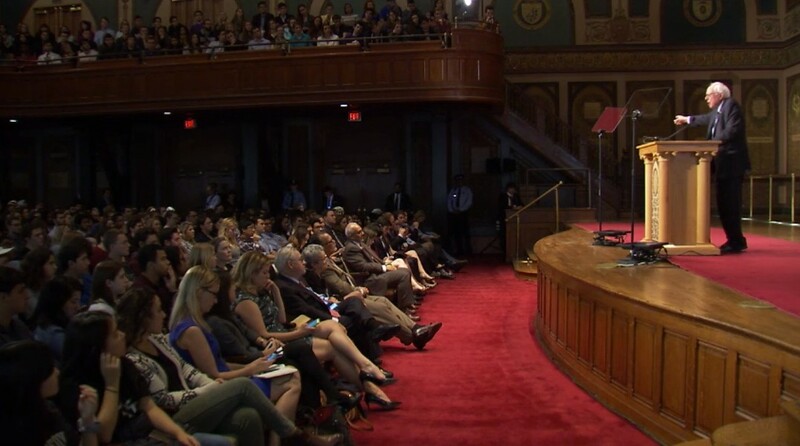 Speaking Thursday afternoon at Georgetown University in Washington, D.C., the independent from Vermont sought to put those questions to rest. 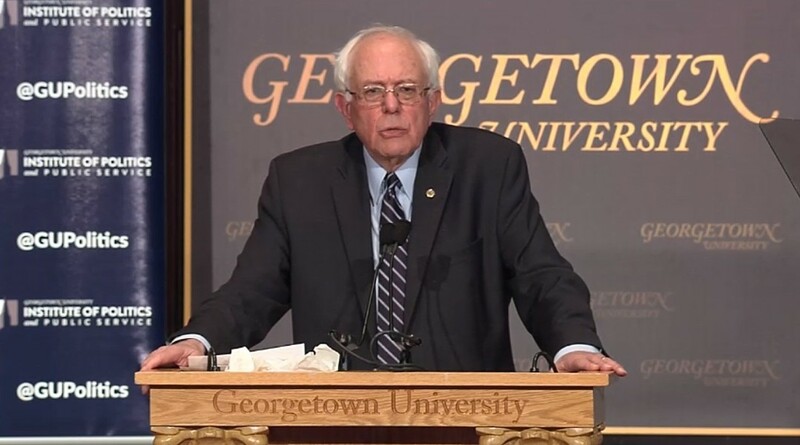 "Let me take this opportunity to define for you, simply and straightforwardly, what democratic socialism means to me," he told a supportive audience of students in the university’s ornate Gaston Hall. "It means building on what Franklin Delano Roosevelt said when he fought for guaranteed economic rights for all Americans. And it builds on what Martin Luther King, Jr., said in 1968 when he stated, and I quote, 'This country has socialism for the rich and rugged individualism for the poor.'" In a forceful, unapologetic tone, Sanders defended the ideology to which he’s long subscribed as nothing more radical than a desire for economic justice. Abandoning his campaign-trail comparisons to Scandinavian political systems, he instead framed democratic socialism as entirely American. To drive his point home, Sanders repeatedly invoked Roosevelt’s 1944 State of the Union address, which the candidate described as “one of the most important speeches ever made by a president.” In it, Roosevelt called for a “second bill of rights,” which the 32nd president said should guarantee such basic human necessities as decent pay, food, education and health care. “‘We have come to a clear realization of the fact that true individual freedom cannot exist without economic security and independence,’” Sanders quoted FDR as saying. "That was Roosevelt's vision 70 years ago. It is my vision today. It is a vision that we have not yet achieved. And it is time that we did." In the month since Sanders first promised to deliver a speech explaining his democratic socialism, many compared it to those in which John F. Kennedy addressed his Catholicism, Mitt Romney his Mormonism and Barack Obama his relationship with a controversial pastor. In each case, the candidates in question hoped to defuse a source of lingering apprehension in the minds of voters. Sanders’ hour-and-eight-minute address was more formal and scripted than the extemporaneous monologues he’s accustomed to delivering, but he occasionally veered away from his prepared remarks. At times, he even allowed for some humor. 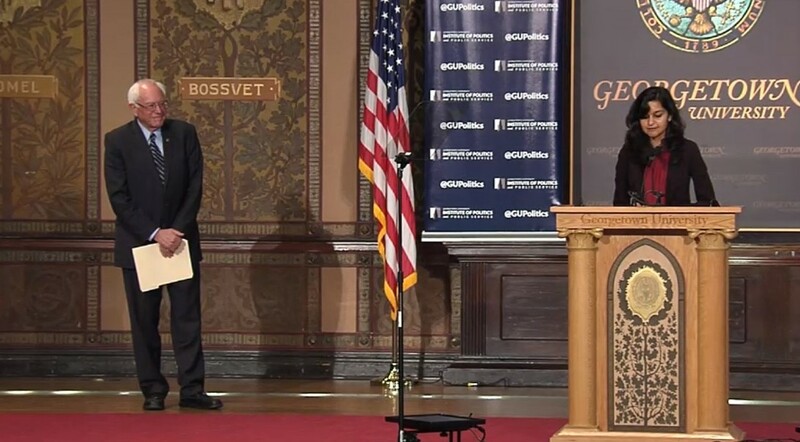 Though his advisers once promised he would deliver a series of formal speeches on topics ranging from democratic socialism to foreign policy to tax policy, Sanders opted to fold two topics into one on Thursday. After spending more than 50 minutes discussing his economic priorities, Sanders abruptly shifted to foreign affairs. As he did during last Saturday’s Democratic debate in Des Moines, Sanders tied the rise of ISIS to the United States' 2003 invasion of Iraq, which he opposed and which Clinton supported. “Our response must begin with an understanding of past mistakes and missteps in our previous approaches to foreign policy,” he said. “It begins with the acknowledgment that unilateral action should be a last resort, not a first resort — and that ill-conceived military decisions, such as the invasion of Iraq, can wreak far-reaching devastation and destabilization over regions for decades." Sanders' remarks on terrorism and national security included few new policy prescriptions. But he did elaborate on his long-stated desire to convince other nations — specifically, those with majority Muslim populations — to take the lead in a global coalition to fight ISIS. "We must create a new organization like NATO to confront the security threats of the 21st century — an organization that emphasizes cooperation and collaboration to defeat the rise of violent extremism and importantly to address the root causes underlying these brutal acts," he said, recommending that such an entity include Russia and members of the Arab League. "But let’s be very clear," he continued. "While the U.S. and other western nations have the strength of our militaries and political systems, the fight against ISIS is a struggle for the soul of Islam, and countering violent extremism and destroying ISIS must be done primarily by Muslim nations — with the strong support of their global partners." Sanders did not make clear how he would convince such nations to join the U.S. in fighting ISIS.